Wildlife Encounters of Nebraska is a non-profit 501(c)3 organization that is dedicated to educating the public about our natural world while offering a home for wild animals in need. Wildlife Encounter’s award winning educational programs have been seen and heard by over 1 million students nationwide. Our programs are based on the core value of connecting the next generation to our natural world. Engaging students in wildlife conservation and environmental education fosters compassion for all animals and the responsible use of our natural resources, resulting in responsible citizens of our planet. By utilizing our wildlife educator training program, working with top industry professionals, and sharing our deep compassion for wildlife, we continually rank as one of the highest quality wildlife educational programs throughout the United States. Wildlife Encounters is state and federally licensed, fully insured, and inspected by the USDA. 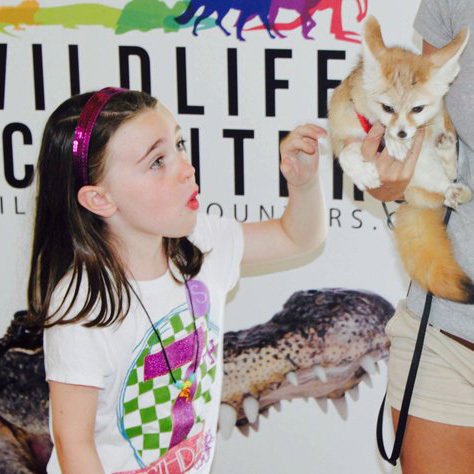 Fun & Educational Wildlife Birthday Parties are a great way to entertain kids while learning about animals! Kids always get excited to pick up a book on animals after getting eye to eye with an alligator, fox or snake! Our presentations follow the Nebraska Education Curriculum and are excellent for assemblies, grades or classrooms! Learning about nature has never been so fun! Great for scout meetings or Blue and Gold Banquets! This year’s VBS theme is “ROAR!” and all about African animals. Want to get guest up close and personal to some amazing animals? !